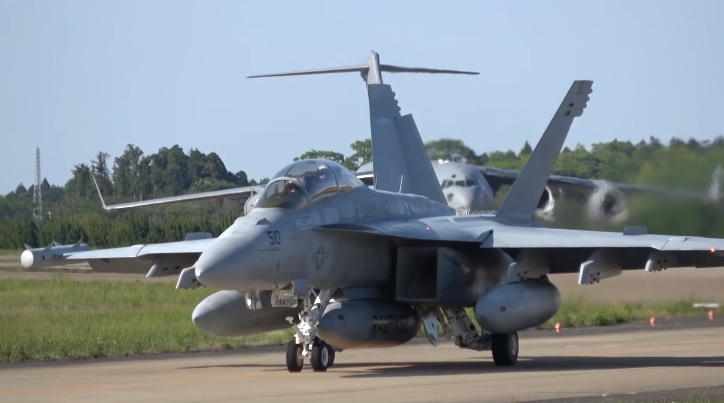 Taken on May 14, 2018 the interesting video in this post features an a EA-18G assigned to VAQ-138 Yellow Jackets making an emergency landing at Hyakuri Air Base. It was accompanied by another Growler, both were flying from Guam to Misawa Air Base when a cockpit indicator showed that one was running low on fuel. They were joined by a C-17 later in the afternoon to provide support. By mid-afternoon, all three left Hyakuri. According Stars and Stripes, the incident is the latest in a string of unscheduled landings by U.S. military aircraft in Japan this year. Late last month, an MV-22 Osprey made a precautionary landing in Kagoshima prefecture after a cockpit warning light came on. That same week, there were emergency landings made by an F-35B Lightning II stealth fighter and a UH-1Y Venom. On Jan. 23, an AH-1Z Viper helicopter made an emergency landing at a municipal helipad on Okinawa’s Tonaki Island. Similar incidents happened on the southern island prefecture on Jan. 6 and Jan. 8.